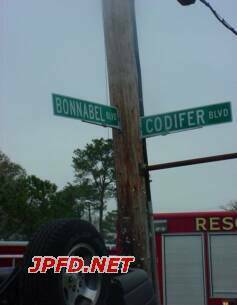 At 3:30pm firefighters responded to a reported 3 car wreck at the corner of Codifer and Bonnabel Blvd. While the units were in route to the scene, the dispatcher stated that 2 cars and not 3 were involved in an accident. 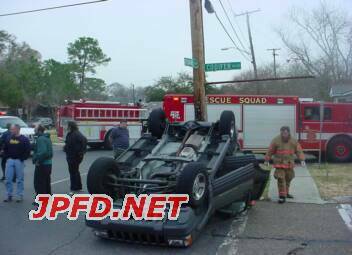 Once they arrived on the scene, firefighters assisted ems personnel by taking the victim safely out of the overturned suv. An elderly female in a tan car ran the 4-way stop, hit the suv, and caused it to flip. 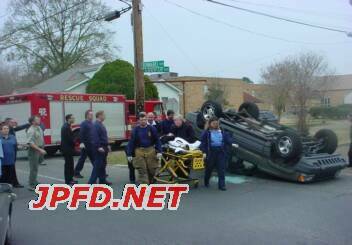 1/20/02: Accident@Codifer and Bonnabel Blvd.